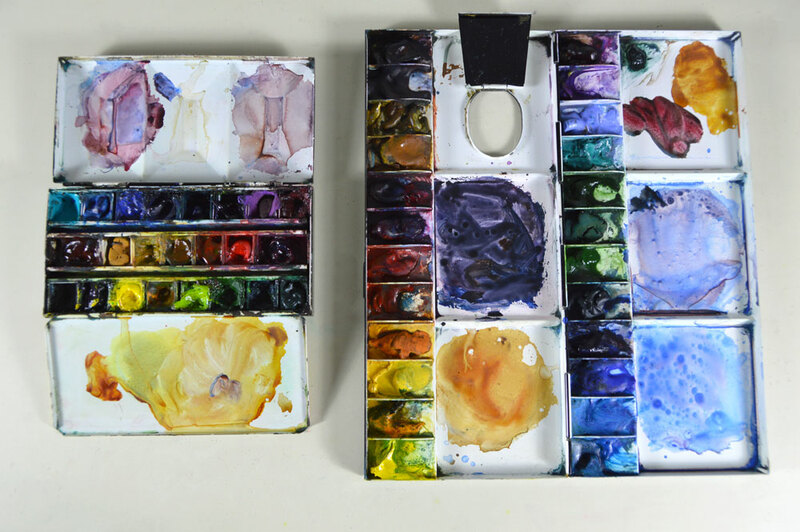 I’ve been wanting to update my list of sketching and painting materials on my blog for a very long time so I started the process today by setting up my two palettes to clean them. I had to laugh because they were both so dirty, that I decided to take a photo first, just to show you what they look like after a bit of use and before a good cleaning. I’m preparing a materials list for my upcoming 2019 workshops, and restocking my colours is the first step in the process. I often change the colours, so winter is a good time to check what I am using and update my lists. The small palette I use for sketching is an Italian one made by FOME, and I’ve filled it with 23 empty pans, and then added tube colours to that. After much cleaning, scraping, and finally refilling, my 23 pan metal palette looks something like this. A bit worse for wear (one hinge broke this summer and has been repaired) but not quite so goopy. I love the size of this palette for travel because when it’s closed it’s about the size of my phone and fits in the smallest of sketching bags. Top row: Cobalt Teal, Cerulean Blue, Cobalt Blue, Ultramarine Blue, Prussian Blue, Indanthrene Blue, Cobalt Violet and Permanent Alizarin Crimson. Middle row: Burnt Sienna, Raw Sienna, Yellow Ochre, Quinacridone Gold, Transparent Orange, Cadmium Red Deep, Quinacridone Rose. 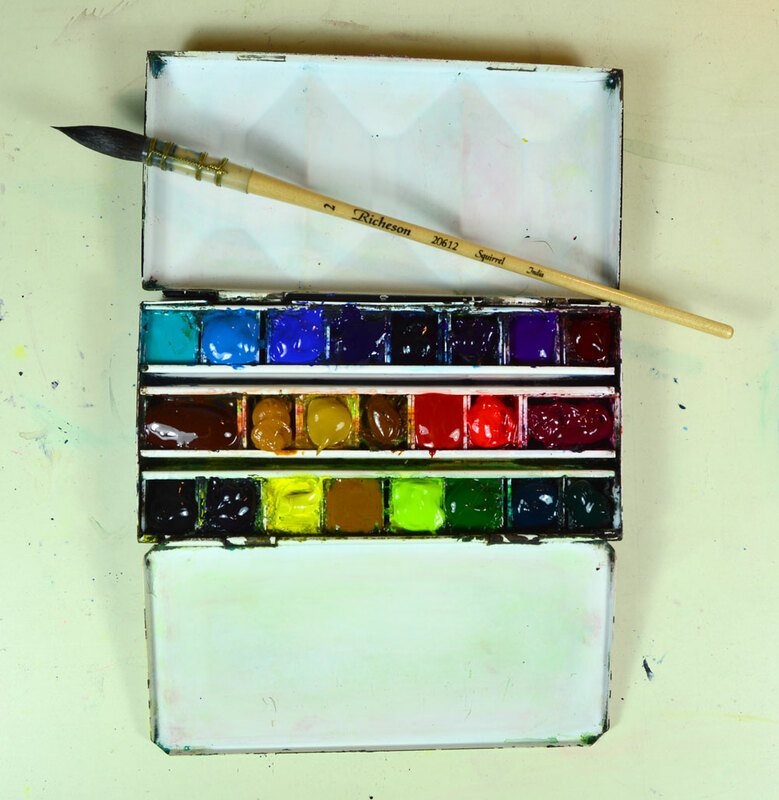 Bottom Row: Lunar Black, Indigo, Hansa Yellow Light, New Gamboge, Leaf Green, Sap Green, Phthalo Green, Forest Green. If you are interested in knowing the brands, the tubes are below, photographed in the same order as the placement in the palette. 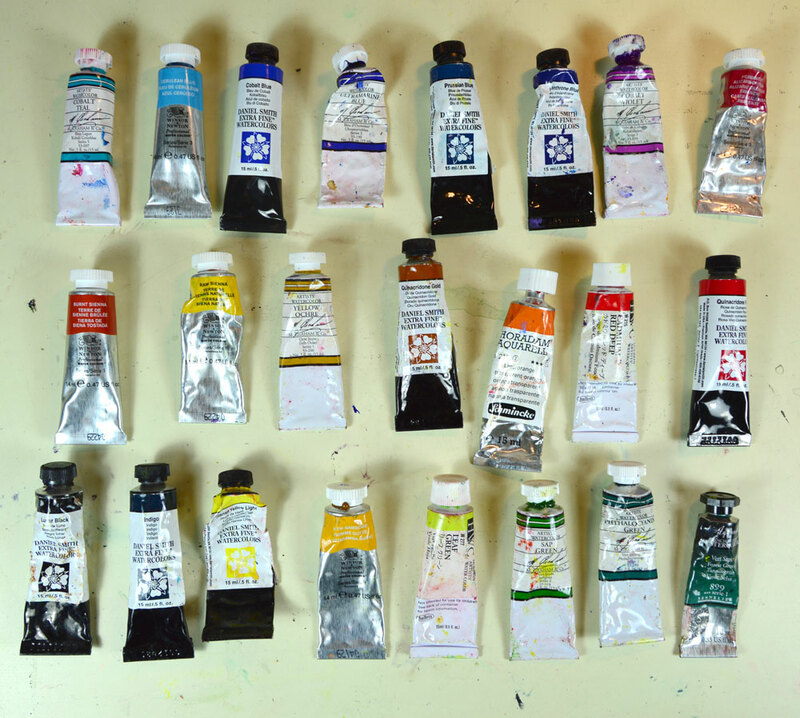 The next post will be the larger studio palette, cleaned and refilled, of course! Thank you Shari for this very useful information! Look forward to your next post on this topic. I’m glad it was useful for you Gayle. It’s always good to reset the colours, evaluate what you use and what you don’t, etc. I love the exercise. I am interested in your placement of pigments in your palette. All the blues are on the top row. I normally start with my yellows and work my way across through oranges reds then blues. I guess it is what you get use to. As long as your brush knows where to go…it is good! That’s a good question and you answered it too. As long as the brush knows where to go. For this palette, I have been using it like this for two years now so as long I know where everything is, that’s all that matters. I do use a lot of blues in my work, btw, so having them there is really useful for me. And now I just checked how I hold the palette and the blues are on the bottom when my thumb in the ring under the palette. So I guess I should have turned the palette before taking the photo. I love posts like this. Thanks! It’s refreshing to have a clean palette. Thanks Jean. I think everyone is fascinated with everyone else’s use of colour. I know I am. If I buy a new watercolour book the first page I turn to is the page on colour! Really enjoy that you show us the tubes, not just a color list, thank you. And you put Indigo on the bottom, not with the blues, why is that, please? Also, is there a reason you pick certain brands for certain colors? Since you have ‘magic’ colors, I gotta know if it makes a big difference so I can have ‘magic’ colors, too! I am brand loyal for certain colours: Cerulean Blue and Burnt Sienna are always from Winsor & Newton. I love some of the M. Graham colours like Cobalt Teal and Cobalt Violet and there is nothing like Schminke Transparent Orange. So those are my magic secrets. Thank you Shari for the new materials posts, they are always a treasure. I noticed that you had only 2 full pans, one for the ever popular burnt sienna and the other for permanent rose. 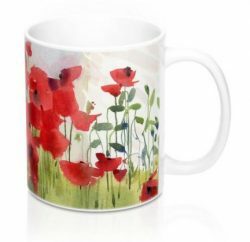 Are you using now permanent rose more often than alizarin crimson? You have a good eye Katerina. I do use Quin Rose more than Alizarin now, especially for purple mixes. But if I want a good dark, I always use Alizarin instead of Rose. And yes, I chose the full pans for colours I use more frequently. Could have used one for Cerulean Blue too! I hope you got some good ideas from this Lisa. Have a great vacation. Very interesting! I’m surprised to see that bright “Leaf Green”. And so many blues. Alison, I added the leaf green before I went to Ireland, and then left it in there. I love using that in the spring. As for blues, I do use lots of blue in my work. Couldn’t do without Cobalt for snow, Cerulean for skies, Ultramarine for mixing with Burnt Sienna to get grey… Of course I don’t need all of these but I have room so why not? Thanks for the post… you inspired me to work up a new palette myself… and to finish up the paintings I have been doing with my current palette. Hi Joe, I’m glad it was useful info for you. Posts about palettes are always so popular. I think everyone loves to see the colours. Cleaning mine now.. yes I am a shari’s Copycat!! And proud to be one!! Are you going to add anything new to yours? Good question about the earth tones Valerie. Although they seem very similar, Raw Sienna is transparent and Yellow Ochre is opaque, so I use them very differently. I often use a very diluted Raw Sienna wash in my skies, before I add blues or greys. It is so transparent that it just gives a warm glow to the sky. On the other hand I use Yellow Ochre much later in a painting because it is opaque, so it’s great for foreground texture and yellowish grass in landscapes. Your palettes look fairly clean as compared to mine 🙂 I tend to reserve areas for mixing greens, reds, blues and browns. Lately I have been trying to mix more colours directly on the paper, so my palette doesn’t end up that wet. I also like the wells on the little palette because I can mix colours directly there too and they stay separate. Any tips on cleaning a palette? I find I often make more of a mess than when I started. I have a good way to clean the palette Judy. I have a spray bottle so I spray the mixing areas with water and wipe off the excess paint. As for the wells of colour, I use a tiny knife blade to remove the dried up paint on the edges. It works really well. So you don’t use water between the paints. I think that is what makes the mess.I’ll try knife scraping next time. Thanks. I don’t wet the paints unless they are really dirty. Thanks Shari..love the palettes dirty or clean! Thanks Donna. It helps me get organized when I write all of this too. Je suis contente d’avoir les couleurs de Shari Blaukopf car je veux essayer de peindre comme elle j’aime sa manière de travailler ce qu’elle voit de ses yeux. J’aimerais faire ta photo dans le mur que tu m’as donnée avec son style. Un projet….. This is a great choice of colors. What do you intend to paint?